Apple’s AirPods might’ve helped popularize the true wireless earbuds trend, but they’re not the best option out there these days. In fact, they’re nowhere close anymore because the top headphones makers out there all have their own options now. Our favorite by a narrow margin are the Master & Dynamic MW07 True Wireless Earphones, which are great if you can swallow the heft $300 price tag. 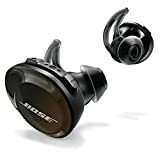 Coming in at a close second, however, are the Bose SoundSport Free Truly Wireless Sport Headphones, and they happen to be on sale right now at their lowest price ever ahead of Black Friday. In fact, they’re only $10 more than Apple’s AirPods!